5CC is a cocktail bar found above the Exmouth Arms in Clerkenwell. This chic bar offers a varied selection of cocktails including 5CC signature choices. "5CC Exmouth is a cosy intimate space located above the Exmouth Arms. 5CC are into handmade cocktails made with fresh produce, so that's what you'll be getting! The bar prides itself in creating good drinks and doing them well, with a wide selection of both twists on classics and signature cocktails. With a large focus on everything agave based, the guys behind the stick will always find a drink tailored to your tastes. A concise selection of snacks and nibbles is also available, this is the perfect place for a date or a tranquil drink and a chat. 5CC Exmouth is a sister bar to 5CC Bethnal Green, 5CC Farringdon and 5CC Hoxton. 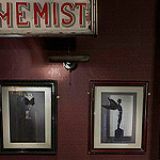 All priding themselves in creating expertly made cocktails, a chilled and relaxed environment in a quirky setting and a perfect place for a good drink in a timeless setting." What did you think of 5CC? This second bar in the 5CC armoury has been sat very quietly above the Exmouth Arms for the last two months – it doesn’t get more secretive than that. Found up the stairs in the Exmouth Arms, you’ll need to know about this bar to even think of finding it. But once you reach the door a neon cocktail sign gives up the game. 5CC follows the speakeasy template to a tee, with natural light eliminated from the room by slatted window shutters and candlelight dominating. 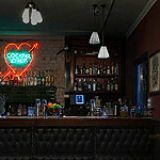 Although vintage glass cabinets stocked with authentic old bottles of booze add to this sentiment, the bar plays its own modern spin on the Prohibition-based trend, instead opting for occasional neon light fittings – the electric love heart behind the bar boldly spells out ‘cocktail lovers’ – and modern taxidermy that is so on trend. Lights are so low and bar staff are dolled up in the 1920s barkeep attire that mixologists across London must be getting so comfortable in these days. This costume is also present on the girls who waltz round offering table service - just don’t expect this to come for free, with a charge added at the end of your bill. Modern synth pop and contemporary indie tunes from the likes of Two Door Cinema Club and Cat Power, to name a few, remind you that this isn’t quite the full treatment of a speakeasy bar. 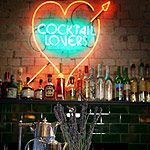 5CC is still a bit of a word-of-mouth destination and groups of stylish girlfriends giggle excitedly as they discover this secret bar, while slicker-looking older couples continue to play it cool. Oysters may be the only option, but what a decadent way to dine while drinking. They come freshly shucked with all the trimmings (£2.50 for a single or £12 for half a dozen), or wrapped in bacon and served with creamed leeks and crushed hazelnuts (£3 for a single or £14 for half a dozen). To its credit, even if the speakeasy style may feel like jumping on the bandwagon to the jaded, the drinks are the real deal here. 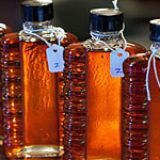 This is evident in the range of vintage liquors acquired by 5CC – including Antica Formula vermouth, Old Portero rye and Booth’s, a London gin no longer in production - that can be mixed into your cocktail of choice or shaken into a drink on the 5CC Vintage Selection menu, such as the 7 to 1 Martini (seven parts gin, one part vermouth). For the less vintage-obsessed, other 5CC creations are just as inspired. The Lemon Drop (£9), crafted from a mix of vanilla liqueurs and infused vodka with limoncello is an uplifting tipple and a great way to start the evening off. A Cosmo Daisy (£9) is another sweet tipple that takes inspiration from the original 1920s Cosmopolitan recipe. If sweet isn’t your thing, the Honey Sour (£10) with American honey whiskey, lemon and sugar is a smooth and slightly bitter drink that will have you coming over all Don Draper. Or try the Lavender Fizz (£9), a gin-based cocktail delicately laced with lavender flavour and with a sprig of the fragrant stuff poking out the top. 5CC may not have re-written the book on speakeasy bars, but the cocktails are original and prepared with aplomb.